The Last Supper is a painting by Leonardo da Vinci. Editorial credit: Renata Sedmakova / Shutterstock.com. Every year, millions of Christians around the world celebrate the Easter holiday to commemorate the death and resurrection of Jesus Christ. Before his crucifixion, Jesus called his twelve disciples together to share a meal in what came to be known as the "last supper". In the last five years leading to the end of the 15th century, probably between 1495 and 1498, painter Leonardo da Vinci painted a mural that depicts the last supper including the consternation among the disciples when he reveals to them that one of them would finally betray him. The mural is an iconic Renaissance masterpiece and one of the most famous works of the painter as well as the most famous painting of the last supper Jesus had with his disciples. It has been praised, studied, and copied by other painters for the past half millennium. Today, the wall lingers on the wall of the Santa Maria delle Grazie in Milan. The painting measures 180 inches by 350 inches and occupies a wall of a dining hall at the Santa Maria delle Grazie in Milan. There is no exact date for when the painting began or was completed, but it is believed that Leonardo did not work on the painting continuously and in fact took three years to complete it. Documents from 1947 indicate that the painting was almost complete and that Leonardo had written to the then monastery complaining that he could not find a villainous face for Judas. The Last Supper portrays the different reactions exhibited by the disciples upon receiving the news, Judas, Peter, John, and Jesus were positively identified before a manuscript by Leonard revealed all the other disciples from Left to right. Just like other paintings of the last supper, Leonardo sets Jesus and the disciples on one side of the table so no one would show their backs on the viewer. Unlike other photos that sit Judas on the opposite side of the table, Leonardo sets Judas to lean back into shadow. When Jesus passes the news by stating that the one who will betray him sits at the table with him and will share the bread, He points to the bread in front of him with his left hand. 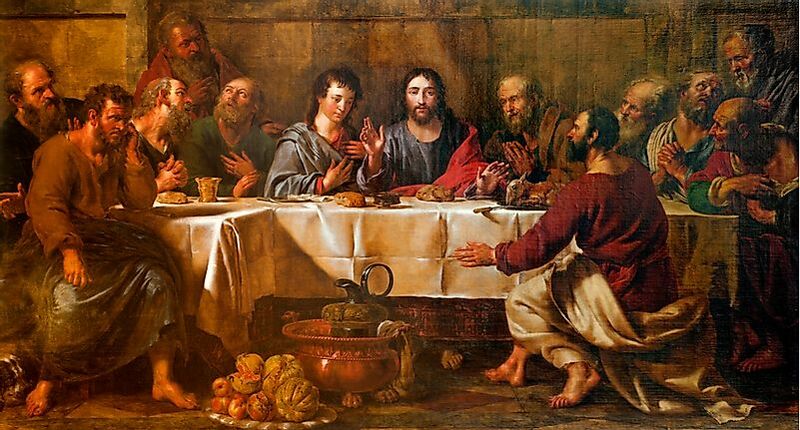 Thomas and James to his left are horrified, Judas is distracted by the conversation between John and Peter and picks up the bread and fails to notice that Jesus is pointing at the same bread with his left hand. There are two known copies of the Last Supper painted by Leonardo's assistants, they are almost the same size as the original paint, and their details are still intact. The copy by Giampietrino is located at the Royal Academy of Arts, London, and another copy by Cesare da Sestois is housed at the Church of St. Ambrogio, Switzerland, while an “oil on canvas” copy hangs on display at the Leonardo da Vinci Museum in Belgium. The painting was done on a thin exterior wall which was affected by humidity and began to deteriorate as soon as it was completed. It had started to flake by 1517 and by 1566, less than sixty years after it was completed, it was already ruined so much that one could not tell what it was. Michelangelo Bellotti was the first person to initiate the restoration of the painting in 1726 by filling in the mission parts and several other artists also stepped in to restore the painting. Between 1978 and 1999, major restorations were done to the painting including transforming the refectory into a sealed, climate-controlled environment to protect against weather hazards.